Thanks to its picturesque West Coast location and the fact that its downtown core sits on a peninsula, Vancouver is a city full of beaches, and they’re usually brimming with locals and visitors during the city’s brief summer. Keep reading to discover where you can find the best beaches in this British Columbia city. 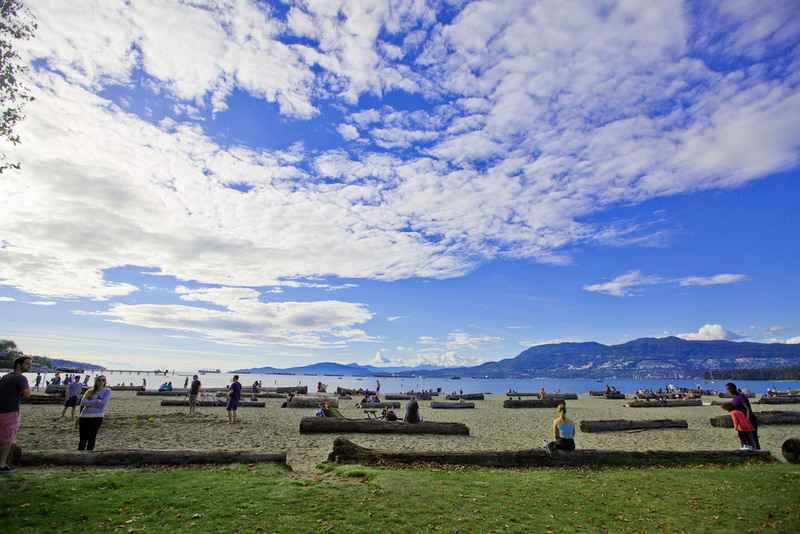 One of the most sought-after beaches in Vancouver, Kitsilano Beach (known as Kits Beach to locals) is not just a beach. There’s ample green park space for sunbathers and several volleyball courts established on the sand. There’s also Kitsilano Pool, which is Vancouver’s only saltwater swimming pool, and snack options, such as Starbucks, across the road. The walk from Kits around the bend to Granville Island is a local favorite, due to its views of the city and surrounding mountains. Located in Pacific Spirit Regional Park, Wreck Beach is North America’s largest naturist beach, stretching for 7.8 kilometers (4.8 miles) near the University of British Columbia campus. The world-renowned clothing-optional beach attracts both locals and visitors. It’s also an excellent sunset spot, thanks to its perfect westerly position. Second Beach is one of many beaches located around Stanley Park on Vancouver’s downtown peninsula. It’s popular because it’s home to Second Beach Pool, which is an outdoor heated pool open seasonally. There’s also a snack stand, playground, stand-alone barbecue area, and picnic shelter. Second Beach is located on the Seawall too. Located west of Kitsilano, Jericho Beach is well liked by swimmers and sailors. The beach’s east side caters to beachgoers, while its west side is for sailboats and windsurfers. Besides swimming, picnicking, and enjoying the Vancouver views, there are a lot of fun recreational activities to enjoy at Jericho Beach, including soccer, volleyball, tennis, and baseball. Ambleside Beach sits in Ambleside Park in West Vancouver. It’s a favorite with locals for a number of reasons. Firstly, there’s a large off-leash area for dogs, so they don’t have to miss out on the fun. Secondly, the views of Stanley Park and the Lions Gate Bridge are unbeatable. Thirdly, there’s a large waterfront walking path that stretches throughout the park. Visitors will find Sunset Beach south of downtown Vancouver and close to the Burrard Bridge. It’s less popular than its counterparts, but it is close to both the False Creek Aquabus Ferry and Vancouver Aquatic Centre. Sunset Beach is a designated quiet beach, which means no amplified sound is allowed. Of course, seeing the sunset from this area is a requirement. Third Beach, located at Ferguson Point in Stanley Park, has a long, sandy beach surrounded by trees, which help shield visitors from the urban noise of Vancouver’s downtown core. Third Beach’s slightly reclusive position means it isn’t as crowded as other Stanley Park beaches. It’s also a perfect place to park and walk to see Siwash Rock, one of the most photographed landmarks in Stanley Park (and Vancouver). There are three distinct parts to Spanish Banks—Spanish Banks East, West, and Extension—and its name commemorates the time when the English and Spanish met on its shores in 1792. Spanish Banks East and West have the same amenities, but West is a designated quiet beach. Meanwhile, the Extension is a kiteboarding launch zone. At low tide, the water at Spanish Banks can recede one kilometer (0.6 miles) offshore. Located between Burnaby and Port Moody on the Barnet Highway, locals and visitors alike will love visiting Barnet Marine Park. It offers stunning views of the Burrard Inlet from its large sandy beach. There are also picnic tables, scenic walking trails, and an off-leash dog area. Across the inlet from Barnet Marine Park is Cates Park. English Bay Beach (also known as First Beach) is the most famous and frequented beach in Vancouver’s downtown area, conveniently located off Denman Street, with its mass of restaurant and food options. You can rent beach umbrellas, chairs, and kayaks here, or swim to the raft offshore with its large slide. English Bay Beach is also the location of Vancouver’s annual New Year’s Day Polar Bear Swim—one of the world’s oldest and largest.